The Samsung company has presented the most advanced terminal of its mid-range family. 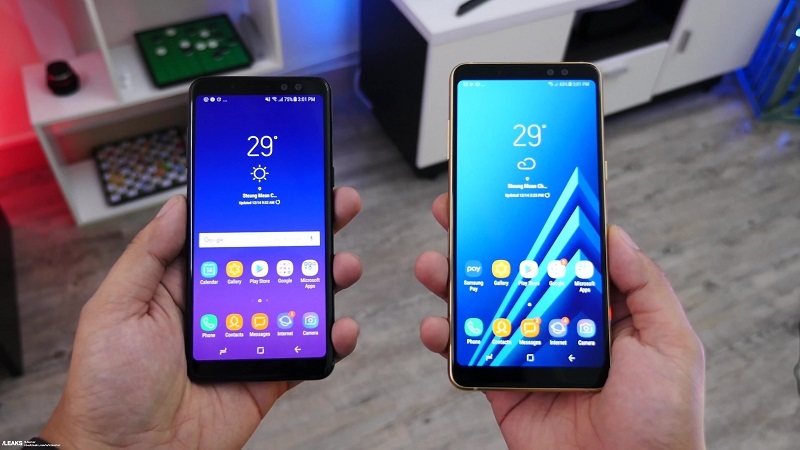 We talk about the Samsung Galaxy A8 2018. A terminal that surprises for its finishes and capabilities, which differ little from the experience of having a Samsung Galaxy S8 in hand. Yes, with a price of 620 dollars . And it is that the quality has a price, although it is not very competitive. 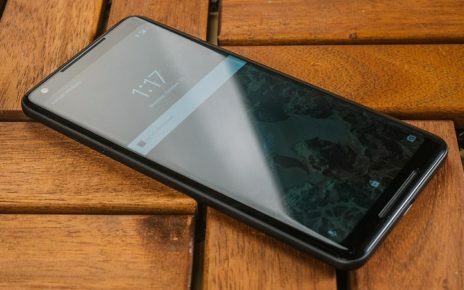 Among the features that stand out of this Samsung Galaxy A8 are its cameras. 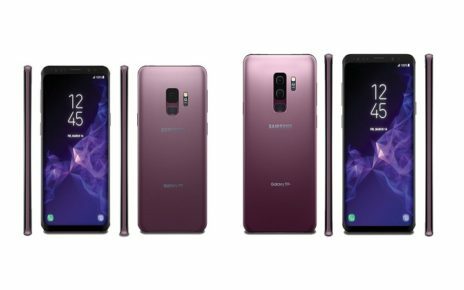 And it has three , adding to the fashion of the dual camera to achieve the bokeh effect or selective blur that included the Galaxy Note 8. The point is that this dual system is frontal, so we do not need anyone to take the portrait. Although the sensor that gets better results is on the back of the mobile. In this article we are going to review the different shooting modes so that you know in detail everything that this terminal is capable of doing for you in the photographic field. As it happens from the Samsung Galaxy S8, all the last terminals of the company have a version of the layer of customization of Android very similar. We speak of Touchwiz that, together with the same camera application, offers a very similar experience among all the terminals . Change, as expected, the quality of the results depending on the camera they carry. Lens shift : In the lower left corner of the selfie there is a small button that can go unnoticed. Actually it’s about the aim change function between the two available for the selfie. While one of the objectives is angular, the other is wide-angle. Or what is the same, one offers a larger, closer and full of light and color. The other offers less luminous results but a wider viewing angle , especially designed to capture more of the scene. Press again and again to alternate between them and get the best image in each moment. Improvements : the Samsung Galaxy A8 allows to apply improvements in the image even before capturing it. Just click on the lower right corner to unfold the color bars and soften. These functions, if we have framed a face, allow to apply more tonality and eliminate marks to it. The lashes of the lower part do not have to go unnoticed. With which to thin the face or to enlarge the size of the eyes more or less realistically. 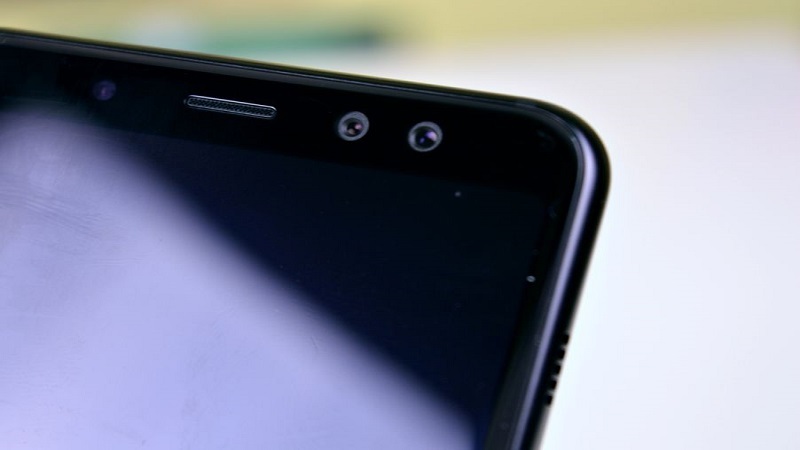 Dynamic focus : by far, the function that is most used when using the selfie cameras of the Samsung Galaxy A8. When pressed, a message alerts us if the function is active. And is that you have to keep the camera at least 40 or 45 centimeters from our face to get that correct blur effect . The good thing is that it applies even to two faces, although the result is always better with one. It has a bar to regulate the blurring of the environment to suit the consumer, all using the functions of color and soften described above. The best thing is that, when taking a photo with dynamic focus. We can also modify it a posteriori from the terminal gallery. 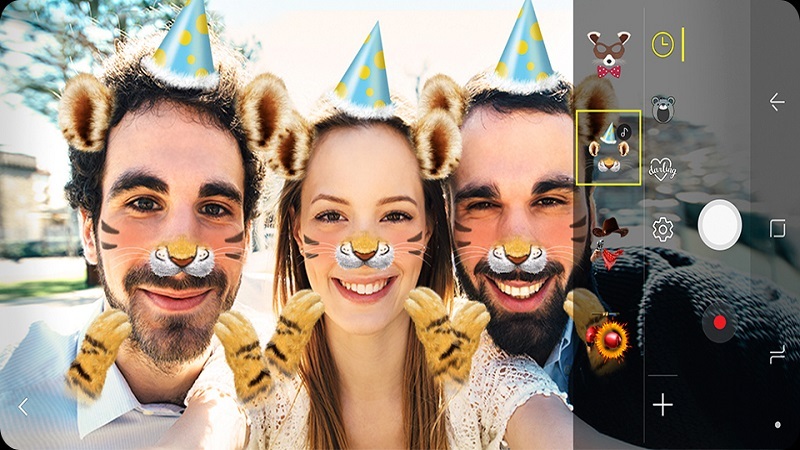 Stickers : It is another of the funniest features of this camera. These are masks that are applied to the user’s face through augmented reality technology. In this way they manage to stay more or less anchored although we move towards the objective, following these movements more or less realistically. There are different categories that can be extended when downloading new packages through the + button. Then you just have to navigate the carousel to choose the desired one and apply it. Many of them have animations and reactions to gestures like opening their mouths. Selfie : is the automatic mode that opens by default . With him you just have to frame and shoot. It allows to press on the screen to mark the attention on some important point of the image. Also use slide the bar of luminosity if we want a clearer or darker image. Panoramic selfie : it is a shooting mode with which to capture a large part of the environment or, directly, make a group selfie without space problems . Just swipe from left to right to select this mode. Then just take a capture and pivot the terminal to capture the left and right of the environment and join the three photos in a panoramic. Night : it is the classic way that increases the time of capture of the image to obtain the greater luminosity and possible detail in an image where hardly there is light. It is useful especially if you use tripod . Otherwise the result will be blurred. Animated GIF : it is one of the extra modes that can only be used if it is downloaded separately from the + button of the modes menu. It consists in firing in burst a good amount of photos to capture a movement in stop-motion . Afterwards, this mode gathers all the snapshots in an animated GIF file that shows the movement with pauses. Stickers : the aforementioned stickers can also be applied to others through this camera. The procedure is the same, and the stickers maintain their animation . Bixby Vision : We return to talk about virtual technology applied to the reality that the camera captures. On this occasion to detect objects and places in the environment. Thanks to sensors such as GPS and image recognition, the Samsung assistant is able to detect what is in the scene and where it is located. With this we can locate a restaurant framing the image. Or even detect an object and search for references on the Internet. Auto : It is the automatic mode . With it you only have to worry about framing, press the screen on the object you want to focus on and slide your finger on the bar to adjust the brightness. Of course, just to aim and shoot this mode solves situations in very good shape. It is the way indicated for the less experienced in mobile photography. Pro : this is manual mode l. Here we take power over all aspects of the camera. It is a mode only suitable for connoisseurs. White balance, ISO sensitivity and exposure are the three values ​​that can be changed in detail, as well as the focus when clicking on the screen. Panoramic : it is the classic way that allows taking a panoramic photograph from several photographs. It can be used in both vertical and horizontal perspective. Just take a catch and start moving left or right with extreme care. The camera, thanks to the mobile sensors, will guide you to take new consecutive captures and then paste them in a single image. Quick camera : in this case we talk about a video mode that allows to accelerate the captured image. In this way, when playing it, we get a video faster . Very useful for making humor videos. Night : Play again with the shutter speed or capture time to get more detailed images in dark environments . Remember to use this mode only if you have a tripod. Food : foodies or food lovers who also enjoy photographing it have this way to capture food in the best possible way. With it, a blur effect is applied and a set of colors and tones helps create a juicier and more colorful picture. 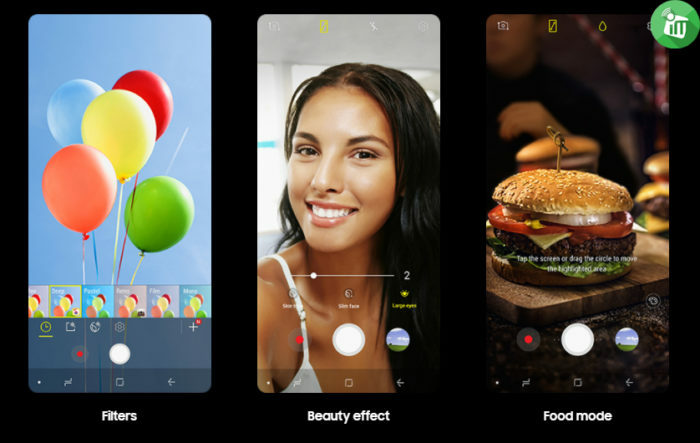 The good thing is that we can change the focus of the photo and, in addition, change the tones with the icon of the palette in the lower right corner. Self-notification : it is a downloadable mode available through the + button. It is really useful to take a selfie with the main camera of the device . You just have to define the space where your face will be in the photograph on the screen. Then we try to frame ourselves blindly, aiming at the back of the terminal. If our face is framed correctly, although blindly, shoot a photo at two seconds with a sound warning. Very useful to not have to ask for help from anyone and get the best photographic quality of the terminal. Sports : is another mode that can be downloaded although, more than one mode is a camera configuration. With it the shutter or capture is accelerated as much as possible to get defined results even if the object portrayed is in motion. Very useful for sports, as long as the camera is static on some support. Animated GIF : this downloadable mode is also available for the main camera of the terminal. With it we can shoot a burst of photos that finally becomes an animated GIF , but this time framing a scene or another person, and not as a selfie. 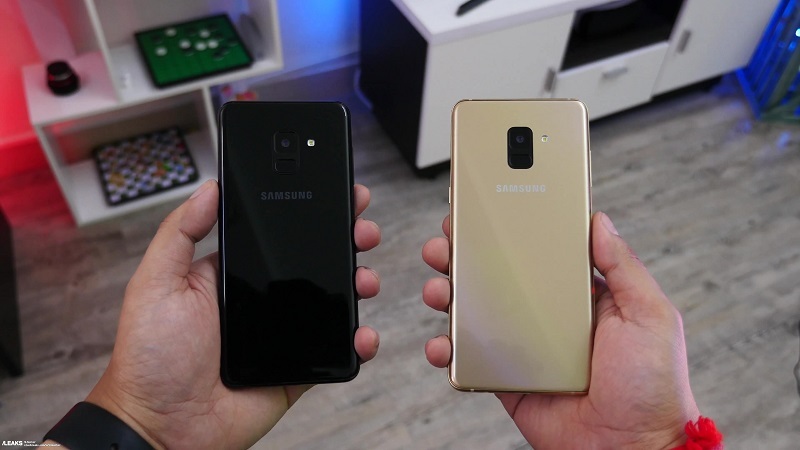 We can not forget the many filters that we can find for both the Samsung Galaxy A8 and another camera. Just slide your finger from right to left to display the menu of these and choose the desired in each case. Black and white, sepia and a great variety more of them. If they are not enough, it is also possible to click on the + button to access the store and download new packages focused on enhancing beauty or changing the colors or light of the image. The variety is immense and, the best thing is, they are all free . 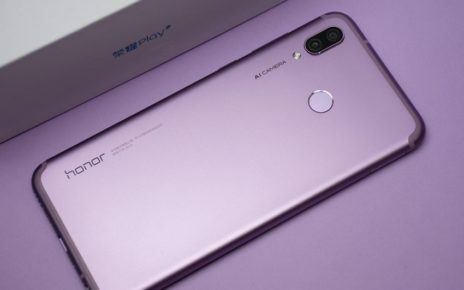 Spread the loveIn a market that seemed already dominated, Huawei, and its second Honor brand have achieved in a very short time not only make a hole but be relevant to their customers. We talk about Honor Play in this article.